When you have a dog, it feels like you have a best friend who loves you unconditionally. You feel the need to take care of it as it is technically the best thing that happened to you. You give it the best food and the best fur supplies, and you take it to the vet when it is not well; you do anything and everything for it. However, it does shed fur from time to time and you find it all over the house, especially on the furniture. Cleaning that is a hassle and can be very time-consuming. The best alternative to having your dog sleep on your bed or other furniture is by getting it its very own bed. Of course, you would want to get the best dog beds available. When you go out to purchase a dog bed, you find many varieties and it would seem that most of them are claiming to be the best dog bed. So how do you know which dog bed you should buy? If you have had your furry friend for a long time, it’s likely you know which one it would love, but if you are a first-timer, it can get quite confusing. When you are looking for a dog bed, you need to take a few things into consideration. This will help you organize your thoughts and decide on the best dog bed for your pooch. First things first, the size of your dog matters. If you feel that your dog would need more space on the bed, you can buy one that is bigger than it, but if not, you can buy the standard size that is available for your dog. Also, make sure you have that much space available in your home. If you are planning on keeping the bed at a particular place, make sure it fits into that space and that your dog is conformable with it. If your dog is particularly heavy, remember that it must be putting a lot of stress on the furniture when it sits on it. It is for this reason that you need to buy a dog bed that is durable. A strong bed will be able to withstand a dog’s weight and will last a longer period of time, which beats buying a new one every time the old one gets worn out. A durable dog bed will also be able to withstand the dog’s sleeping positions if it moves a lot while sleeping and its need to chew. However, if your dog decides to destroy it, there is not much that you can do about it. You will need to take note of how your dog likes to sleep. Whether it likes to sleep hiding somewhere or with its legs up high or rolls up high, dogs have a lot of weird sleeping positions and there is usually one position that they prefer sleeping in. You will need to purchase your dog bed accordingly. The types of dog beds available will help you understand which would be best suited for which position. You will eventually understand the need to have a bed that comes with a removable cover. Dogs have a unique smell to them and, let’s be honest, they can sometimes get stinky, especially when they fart. This, in turn, can stink up the dog bed. If they are dirty and go straight to bed, they will make the bed dirty too. Washing a dog bed is not easy either and when it is wet, it tends to get very heavy and takes a lot of time to dry up. If you have a dog bed whose cover you can remove, you will only need to wash the cover, saving you from a lot of hassle. Though it is easier to get a dog bed made from a simple material for a small dog, it is difficult to find a good material for a large dog. Small dogs weigh very less, so when they sleep on a dog bed, they do not move the filling of the bed to the sides, while the opposite is true for larger dog breeds. For a large dog, the best dog bed type would be the one with memory foam. That way the filling does not go to one side, hence lasting for a longer period of time. We all know the importance of setting up a budget and not exceeding it. It is the same case with this too. Dog beds can be expensive, so if you have a particular budget in mind, it is best that you stick to it and buy a bed that comes within your price range. If you can, keep your budget on the higher side as the best dog beds are a little expensive, but they make up for that with their quality. This is the last thing you need to consider when buying a dog bed. It is basically just an extra thing you can consider if you would like, as your dog and its comfort are what matters more. But if you have options available, try looking for a bed whose color matches that of your home. That way it will look like a part of the decoration and won’t feel out of place at all. These factors are the main ones you need to consider when buying a dog bed for your canine. They will help you choose the type of bed you would like for it. 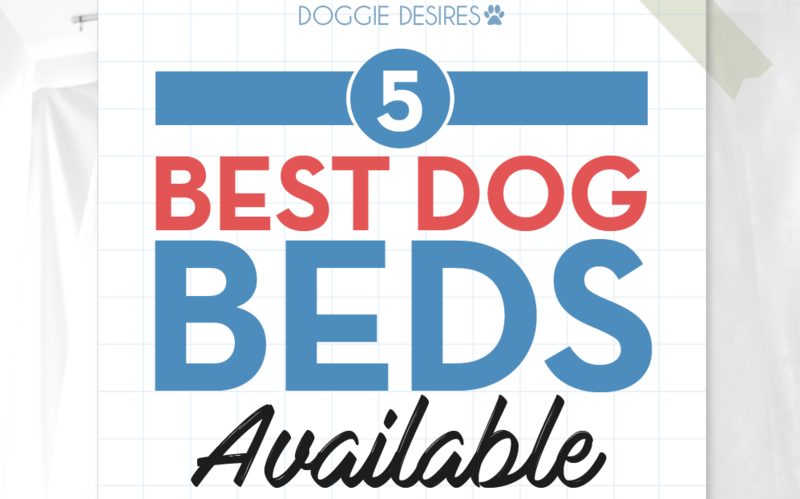 The next thing that you need to know is the top 5 dog beds available. Knowing that will help in the purchasing process and help you decide the best one for your pup. You can also look up different types of dog beds that are available so that you can have a further idea of what you can buy. 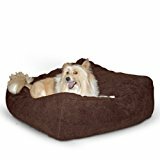 This dog bed is available in three different colors and three different sizes, which are large, extra large and extra extra large. It is best suited for dogs that are considered to be in their elder years. It is not at all suitable for small dog breeds as the bed is too strong for them and they will not be able to make themselves comfortable on it. This bed also comes with a 10-year guarantee. If it is spoilt before that, you will get your money back. It is supposed to retain at least 90% of its original form once the dog has gotten off it. This dog bed also comes in two editions, one with a head rest and one without, so you can pick the one that you feel your dog will be more comfortable with. It can also retain its strength for a very long period of time. The foam is structured such that it does not flatten under the dog’s weight. The bed has a very soft feel to it and ensures that your dog gets the best material available; hence, it is made up of 100% microfiber. Cleaning the bed is quite easy; you can machine wash it easily, though it might take some time to dry. It is one of the best dog beds available and highly recommended for your big dog. This dog bed is available in medium, large, extra large and extra extra large. It also comes in a variety of plain colors and patterns, so you can choose one that best suits your home’s interior or exterior, wherever you plan on keeping it. The dog bed is structured like a couch, basically giving your dog the feeling of sitting on a couch. It would be best to use to help make the transition from sleeping on your couch and onto a dog bed. The bed is made up of a combination of recycled and new fibers and ensures loft retention. The bed is highly durable and is one of the best dog beds available as it is long lasting. The bed is stuffed to the brim and more with bolsters, which ensure that it does not lose its support or go bad from any side. The bed is filled with hypo loft poly fiber filling, which is not easy to shift to the sides of the bed when a heavy dog sits on it. The material of the bed and the way it has been made makes sure that the bed does not bend under stress. Thus, the form of the bed will not be lost easily and lasts a long time. It is one of the best beds to buy if you are looking for something durable. This dog bed comes in 5 different sizes which include medium, large, XL, XXL and SML. It also comes in 4 different colors, giving you a choice to buy the one that will go with your home’s interior. The bed’s frame is made up of high-strength PVC, which can endure up to 125 pounds and is suited for small to medium-sized dogs and even some large dogs. If you have a dog which is heavier than that weight, it is recommended that you look for the same bed but with a different frame which is made up of aluminum. This is one of the best dog beds for big dogs because the frame will make sure that it can withstand a higher weight of the dog. The bed is raised slightly higher than the floor to make sure that it stays dry and cool and ensures an orthopedic design. The bed can be used inside the house or even be placed outdoors. It is advised by the sellers that if you need to keep the bed outdoors, you should use the aluminum bed or the one with the almond color. Thanks to the material it is made up of, the bed is easy to clean. The structure of the bed is such that it does not lose its formation and the traction provided makes sure that it goes back to its original position when the dog gets off the bed. This bed comes in four different sizes that are small, medium, large and extra large. It also comes in a variety of colors, so you can choose one that will go with the interior of your house. The exterior of the dog bed is made up of poly cotton and the cover inside the top and the top itself is made up of faux lamb wool. The bed is easily washable in a machine, though it may take a little while and a lot of time in the sun to dry. The bed inside is filled with cedar/poly fill which makes it durable and ensures that it lasts a long time. This bed comes in three different sizes which are large, small and medium. It also comes in three different colors of your choice. The exterior of the bed is made up of Berber, which makes the bed soft and warm for the dog. The bottom of the dog bed is non-slip, which makes sure that it stays in one place when your dog decides to jump on it. The bed also comes with a removable cover which can be easily washed by hands or machine. It does not take much time to dry as well since it is only the cover that needs to be dried. The inside of the bed is filled with recycled plastic bottles, ensuring that it is sturdy and durable and does not lose its form too easily. It is also one of the best dog beds available as it gives the canine maximum comfort. It is not guaranteed that your dog will tear up the dog bed into smithereens. Dogs have the tendency of destroying furniture pieces, but we love them anyway. So when you are buying a bed for your furry baby, make sure you choose one of the best dog beds available.